Dammit, I got a PM from Richard to delete his double post and I was in the What would you do to your rig today about to post about adding grabars to our JK from my phone, so I went in to delete the post and my tapatalk crashed while I was deleting the post and I lost the whole thread. I'll throw myself under the bus. So anyways, what did you do to your rig Today? For anyone with a jk, these things should come from the factory with GraBars! These things make getting in and out so easy. I'd like something like that for the tj. I use my GraBars every time. 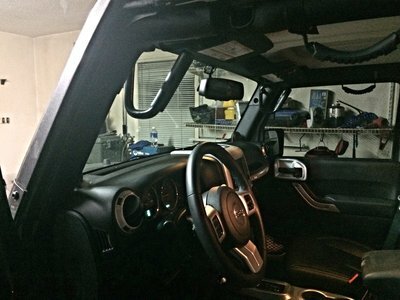 My JKU came with those other handles like you have in the picture and they were awkward and worthless for us. I took them off and slung them in the back of the jeep. I heard about that, thats why I only got the fronts. Did a little axle shopping this morning. Thanks Brooks. Those do look like they'll put a knot on your head in a hurry! Might serve well as a gun rack if you didn't want to see where you were going. Larry gots a pile of 8.8s? HP30 for Dad, 8.8 for Richard, and 8.8 for Tripp. Notice the flat tire... The Air tanks slightly out of sight. Did a little work to the Samurai yesterday. Changed the oil (all 3.7 quarts of it : ), installed new exhaust hangers after the last one broke on the Gulches trip, installed new breather lines on the axles and a few other little things. I REALLY need to get on storage in the rig. It has no storage, no cup holders, and the dash is crappy. I want to put an aluminum dash together but need to come up with some kind of brake. Also found a wrecked Geo Tracker that still runs in Charleston for sale for $550. If he takes $500 I might be heading there this weekend to pick it up for a 1.6 fuel injected swap. I actually worked on my buggy. It feels good to not have to need to work on it. Prepping for Windrock this weekend I wanted to address a few things. Pulled the front driveshaft out to fix the bolts that had broken in Harlan. 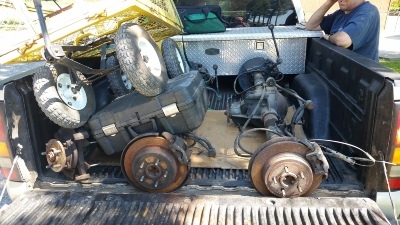 The three that were in there had survived a couple of Gulches trips, but I wanted to be back to 4 bolts on the flange. Drilled the new bolts for safety wire so they won't be backing out on me again. Found a loose front differential so I tightened that up. Also got my LED light bars mounted and ready. Now to get over there to check the fluids, replace a bent suspension link, and load it on a trailer. I also started clearing all the crap off the chassis table from the suburban motor rebuild so I can get back on the new buggy. I finally got around to ordering new tires for the JK. The plan was to use an old set of 16" steelies I have laying around, but I got too sweet of a deal on a set of KO2s that I couldn't pass on. 275/70R18 will probably rub a little with the disconnects even with 18/59 springs. How much does an 8.8 run at lkq?